After the enormous success of Spotlight : Curries/Gravies, it's again the time to announce the theme of this month's Spotlight. When we have got 137 yummy curries and gravies in this month's Spotlight, then we just need some rice or rotis to complete our Lunch/Dinner thali. 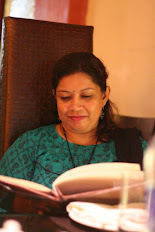 Rice/roti is such a component in an Indian diet, without one our menu can't be complete and we feel empty without them. 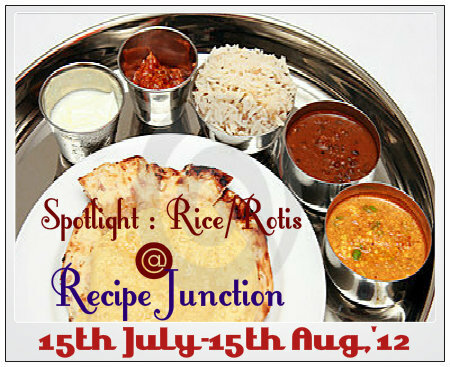 So this month I'm asking you to share your favorite rice, pulao, Biriyani or roti, paratha, puri recipe with us. 1. As the theme is Rice/rotis/pulao/puri , prepare your favorite and best recipes of those. Veg & Non-Veg - both are allowed. Do not send any dessert/sweet dish made from rice etc. Asking for Rice/rotis/pulao/puri recipes to go with curries/gravies or which can be a meal itself. 2. Post it in your blog from July 16 to Aug 15th and link it to this announcement page and original spotlight announcement link. You can send multiple entries. 3. Archived posts are allowed if they are reposted with the link to this announcement page and Original Spotlight announcement link. 4. The use of logo is mandatory as it helps spread the word. 5. Non-bloggers can also send their recipes to the email below. I am looking forward to see all the wonderful creations by my blogger and non blogger friends. I LINKED MY RECIPES. HAPPY HOSTING. Hi, I just submitted my entry.. Looking forward for many interesting dishes!!! I am very new to your space. Submitted 6 recipes to your event just before. Please check and confirm it. Happy hosting.